So what will happen when on a certain day another soul gets washed ashore of this island ? What will both creatures do ? 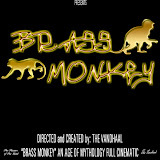 Watch the movie/ music video: Brass Moneky. The movie is alos avilable on the Vandhaal’s YouTube channel. All the Brass Monkey video screenshots can be found in the Age of Mythology Brass Monkey gallery. If the above download links do not work for you just message/ post a comment to The Vandhaal.